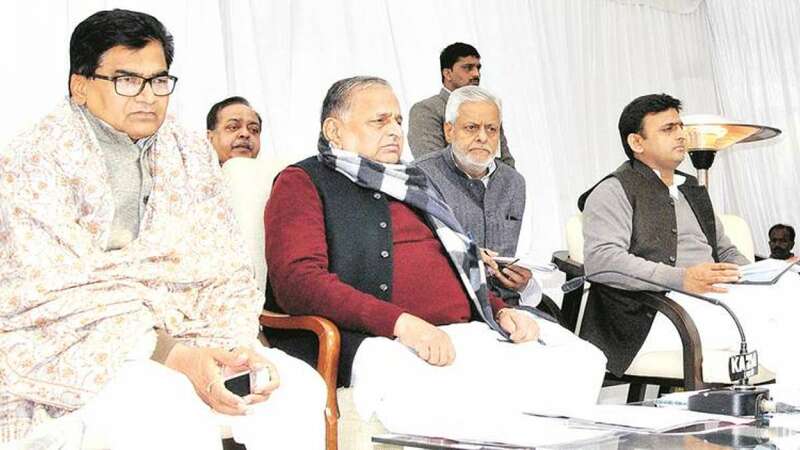 New Delhi : Samajwadi chief Mulayam Singh on Friday took a tough stand, expelled Uttar Pradesh Chief Minister Akhilesh Yadav and Ram Gopal Yadav for 6 years citing Anti-Party Activities. Here are the latets updates on samajwadi party crisis in Uttar Pradesh. Banda (UP): Akhilesh Yadav's supporters stage protest over his expulsion from the party for 6 years, raise slogans against Shivpal Yadav. Lucknow: UP DGP Javeed Ahmed reaches CM Akhilesh Yadav's residence to meet him. Lucknow: Protesters tear down the posters of Shivpal Singh Yadav after Akhilesh Yadav was expelled from the party for 6 years. Lucknow-Supporters gather outside Akhilesh Yadav's residence, raise slogans in his support after SP Chief expelled UP CM for 6 yrs frm party. WATCH Supporters gather outside Akhilesh Yadav's residence, raise slogans in his support after SP Chief expelled him for 6 years from party. Want to urge party workers to come to RM Lohiya University on Jan 1 at 11am to discuss as to how to stop those doing wrong in party-RG Yadav. Lucknow: UP CM Akhilesh Yadav expelled for six years from Samajwadi Party; Supporters gather outside his residence. It's unconstitutional to expel someone without listening to them just hours after issuing show-cause notice-Ram Gopal Yadav on his expulsion. WATCH Akhilesh kya maafi mangega woh toh ladta hai, pita (father) manta hoga toh dekha jayega, says SP Chief Mulayam Singh Yadav.